Time again to pick a theme and look at some contemporary artwork that deals with it. Having just posted about digital afterlife, I began looking for current artists' material on the subject. As with the topic of "pain" art, the idea of "afterlife" is very subjective. If anything, these works all have a bit of the surreal to them. As they should; unlike pain, none of us has been able to live through what comes after life and then document it from personal experience. These are works of the imagination, and so being, can be playful at times. This first image entitled "Afterlife" is a mixed media piece by Donald McIntosh. There is a body on the left, separated from the complicated gears/machine like area on the right. I came across an art site on the web that chooses themes for their artists to contribute to. They actually have an entire art pack dedicated to the theme "afterlife". The site is called Slashtree, and of those in the collection, I've picked out my two favorites to display. 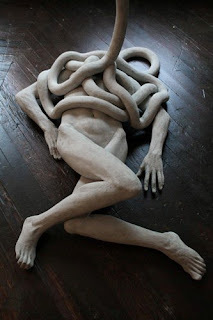 The first is the piece entitled "Afterlife" by Maciej Mizer. A link to the full image here shows how detailed this work is. 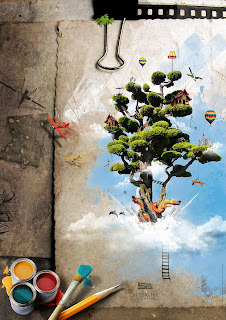 A very imaginative creation with people, homes, castles, hot air balloons and even a McDonald's sign. This next work from Slashtree, although not entitled "afterlife", asks the question behind the concept. The title of this work is "What will it be?" by Dominik. The subject in this work swings or dances, giving the viewer a sense that the answer to the question is at least playful and nothing to be scared of. 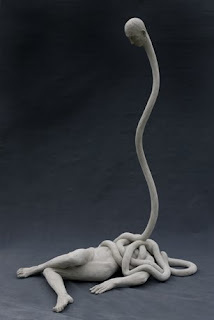 Finally, a bronze sculpture entitled "Afterlife Afterthought" (2005) by artist Emil Alzamora. This 8 foot structure to me depicts the out-of-body concept so many people speak about in near death experiences. Both images are of the same piece. Just a small representation of contemporary works contemplating afterlife. In the future we'll look at some historical works of art with the same theme. As you can imagine the historical works have quite a different approach.